Thermomix - What is it? It's the world's smallest and smartest kitchen appliance. A new dimension in the kitchen, Thermomix TM 31 is the most advanced kitchen appliance on the market today and is without rival. The product of more than 40 years of German design and innovation, Thermomix unites the functions of over 10 appliances in one compact unit. Thermomix will amaze you with its ability to chop, beat, mix, whip, grind, knead, mince, grate, juice, blend, heat, stir, steam and weigh food. No wonder it has earned the title – the world’s smallest, smartest kitchen! Featuring a gearless motor with an unlimited life expectancy, Solingen steel blades and a stainless steel bowl, Thermomix brings a new dimension to food preparation and cooking. Faster and more efficient than any similar appliance, it saves time, money and importantly valuable space in the kitchen. 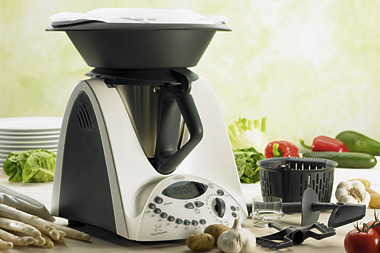 Thermomix lets you return to the tradition of home style cooking using technology of the future. Click here to view a video of the Thermomix in action.